The National Health and Medical Research Council (NHMRC) has granted $2.49 million over five years to establish a Centre for Research Excellence (CRE) to improve health outcomes for children with cerebral palsy. The CRE will build an Australasian Cerebral Palsy Clinical Trials network combining leading research centres in five states of Australia and New Zealand to form an Australian Clinical Trials Alliance. Our network will conduct world standard, multisite, clinical trials to improve early detection and determine the best interventions and treatments for children with cerebral palsy. CIB Professor Iona Novak, The Cerebral Palsy Alliance, The University of Sydney. CIC Professor Euan Wallace, Hudson Institute of Medical Research, Monash University. Cerebral Palsy (CP) is the most common physical disability of childhood, impacting approximately 38,000 people in Australia, with 700 new cases each year. It is caused by a congenital brain injury where 70 per cent of cases occur in the third trimester of pregnancy. Despite the early brain injury, on average children with CP are not diagnosed until 19 months post term and this means that the early period of neuroprotection and delivery of rehabilitation to optimise brain plasticity is misspent. Current services for children with CP in Australia focus on providing medical interventions followed by impairment-focused rehabilitation. Members of our CRE team have identified, from numerous clinical trials and meta-analyses, the need for functionally-focused interventions that commence earlier than is current practice. Our CRE will build an Australasian Cerebral Palsy Clinical Trials network combining leading research centres in five states of Australia and New Zealand to be a member of the Australia Clinical Trials Alliance. The network will conduct world standard multisite clinical trials testing new neuroprotectants identified from pre-clinical trials to be ready for testing in infants at high risk of CP. The CRE team have identified effective rehabilitation strategies in school aged children with CP that show potential for even greater benefits when commenced earlier, optimising the period of greatest brain plasticity. Current evidence from Systematic Reviews conducted by CRE members suggests interventions are not offered early enough to mitigate long term difficulties for children with CP. Closing the gap between research and timely effective practice is crucial to outcomes. Cerebral Palsy impacts 17 million people worldwide, 0.2% of the global population. Cerebral palsy (CP) is a disorder of movement and posture secondary to an insult to the developing brain. While the early brain injury is static, the functional problems are progressive and life-long. Gross motor function plateaus in childhood and declines in adolescence with loss of mobility and the progression of deformity. The disability increases with age and ageing occurs earlier. 1 in 25 were deaf. In addition, co-morbidities impact on growth (children with CP are shorter), nutrition (underweight), feeding, communication and executive function. The European CP registers have identified pain in adolescence as the major comorbidity that reduces participation in education and social functioning. There is a paucity of interventions to optimise function early, to increase participation in education and improve quality of life. In terms of economic burden, CP is the fifth most expensive health condition in Australia. The ensuing disability and costs of care incur significant health and long term social costs (0.14% of GDP, AU$1.47 billion p.a., with an average yearly cost of AU$43,431 per individual). The evidence for increasing cost effectiveness in treatment is sparse. Our population cohorts have examined costs of medical/allied health care and consequences but few studies have evaluated the cost effectiveness of interventions. As CP is an early brain injury, there is greater opportunity to mitigate the brain injury. Our focus will be on earlier rehabilitation to maximise adaption of the brain with motor learning focused rehabilitation and neuroprotectants. We have the opportunity to utilise both the ACPR and NZ CP registers to improve early detection of CP, to conduct earlier clinical trials, to test curative agents, and to test the efficacy of early brain rehabilitation on outcomes at 5 years when children are ascertained in the CP registers. People with CP have identified prevention, cure and reduction of severity as their highest research priorities in an international survey conducted by CI Novak and AI McIntyre. 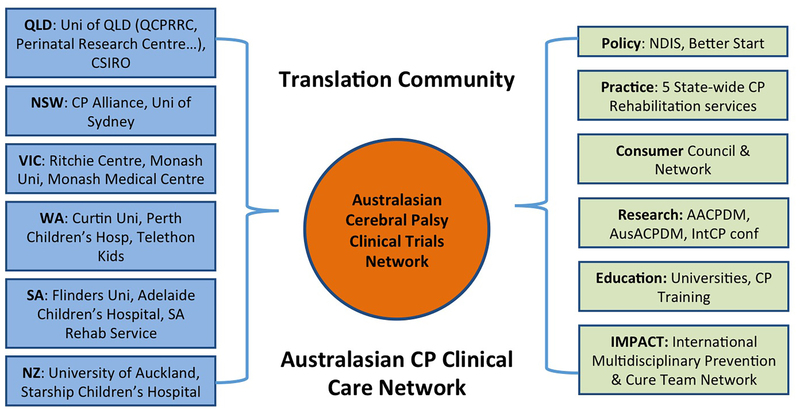 A collaborative effort using multi-centre trials and “big data” aggregation is the best solution for achieving CP consumer research priorities, hence an Australasian CP Clinical Trials Network is urgently needed. In five years’ time, this CRE will have implemented a national program of training in the General Movements assessment (GMs) so that more than 50 per cent of infants with CP will be accurately diagnosed in the first six months post term, one year earlier than current practice. New clinical tests (Neurological and GMs assessments) and MRI biomarkers of CP in the neonatal period have been identified that will enable even earlier detection of CP. New rehabilitation interventions delivered in the first twelve months of life have shown improved functional outcomes in pilot studies and will now be tested in multisite RCT’s. In 5 years’ time, earlier detection of infants at high risk of CP will enable them to be fast tracked to effective interventions leading to enhanced functional outcomes, with increased participation in education and improved quality of life for families. Providing effective interventions that enhance motor, manual, cognitive and communication outcomes in infancy rather than childhood will optimise neuroplasticity. Earlier intervention to improve greater school readiness will lead to higher attainment of skills across the population of children with CP. Current rehabilitation is often inadequate (under-dosed), inappropriate (not based on motor learning principles), and at times simply inaccessible (not available to more than 20 per cent of families in remote areas. Our studies of early detection have identified that GMs at twelve weeks corrected age can determine a high risk of CP at twelve months with high sensitivity and specificity. These videos can be performed by the family on a mobile phone at home and transferred for scoring using an APP for assessment by an expert. This enables isolated families with limited access to MRI to have early expert diagnosis for their infant of high risk of CP. The AusCP-CTN will extend this program nationally and then fast track these infants to clinical trials. In five years’ time, more than 75 per cent of infants will be recruited to clinical trials of neuroprotectants and/or rehabilitation within the first year of life. In five years’ time the rate of CP will be declining and the proportion of independently ambulant children with CP will be increased from 30 per cent to 50 per cent. The network will use common outcome measures enabling pooling of outcomes across clinical trials and the network will develop clinical trials that meet the standards to join the Australia Clinical Trials Alliance. Our team has commenced two international Clinical Practice Guidelines (CPG) for Early Detection and Intervention for infants at high risk of CP. In five years’ time ten new international CPG will be developed. Changed clinical practice will be tested through our links to the Australian and World CP Registers. The network will set standards for measuring the costs and consequences of outcomes, ensuring both effective and efficient service delivery with implementation of the National Disability Insurance Scheme (NDIS). This CRE will be led by a Management Committee consisting of the ten Chief Investigators led by CIA Boyd as chair supported by a full time CRE Manager. The Management committee will maintain close communication through second monthly teleconferences (six per year). Engagement and Health Policy (CI Ziviani). Each theme panel will include at least 2-3 Chief Investigators, 2-3 Associate Investigators, a lead postdoctoral fellow, an Early Career Researcher/Mid-career fellow, and a representative from the Consumer Council. The Clinical Trials theme panel will comprise the CIs with the addition of key Asscoiate Investigators to ensure coverage of disciplines and research areas (AI Ware a senior Biostistician, AI Whittingham a Psychologist, a Health Economist, and AI Barber Muscle Mechanics). Each theme will be responsible for promoting research productivity according to the Key Performance indicators. Regular meetings of the 5 Research Themes will occur at the annual meetings (face to face) and second monthly by teleconference. Each theme panel will select suitable pilot clinical trials to propose to the management committee to proceed to national multi-site studies, critiquing proposals for proof of concept studies and provide key expertise across the network to enhance competiveness of grant proposals. The themes will award post-graduate top-up stipends to the top ranked PhD scholars (14), and training fellowships to 18 post-doctoral (11 new) and clinical fellows. They will also oversee the mentorship program, identify areas of training need, and plan travel for national/international collaborations. The Knowledge Translation and Implementation Committee will prioritise effective interventions for development of international Clinical Practice Guidelines, determine effective interventions for implementation and oversee national Knowledge Translation activities across the clinical network. Five international experts will form an International External Review Panel of the CRE who will perform an annual review of key performance indicators (quantity/quality of outputs, funding inputs, spread and depth of impact) and translation to consumers. The evaluation committee will be chaired by an eminent researcher in the field (one of the international scientists, rotating each year). The evaluation committee will meet through teleconference annually. 1. Uplift earlier detection of CP. 2. Fast-track children to multisite randomised clinical trials of new neuroprotectants. 3. Develop and test new rehabilitation methods. 4. Ensure new knowledge is transferred effectively to enhance clinical practice by overcoming known barriers to implementation. 5. Develop international clinical practice guidelines guided by a consumer network.